Does Randy Moss deserve the deluge of criticism that he has gotten since his little outburst this past weekend? I know I may ruffle some feathers but I am still amazed at the controversy crazed coverage of Boston sports. I am a lifelong Boston Sports fan, that of course includes the Patriots. I was born and raised here so I am no stranger to the Boston Sports fan craze which sometimes I am a part of. Even with this background my initial impression of Randy Moss’ comments this weekend were that he expressed some understandable frustration. I know, I know the timing was bad. Not being a professional sports figure, I do not know what it feels like to have your future determined so publicly from contract to contract. I don’t know what it is like to want to stay somewhere, whether it be a company/sports organization or a city, and have to decide it based on the short career spans that are typical of professional sports. 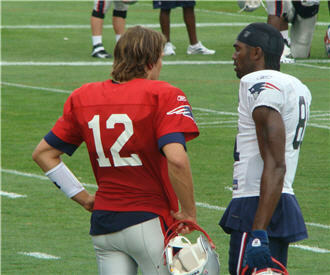 It appears to me Randy Moss wants to continue to play with the New England Patriots. Hopefully the Krafts will be able to offer him something competitive. Though some of us are not accustomed to Moss’ more outspoken nature versus someone like Tom Brady for example he has played relatively well for us and seems to be a critical part of what the team needs to remain competitive in the next few years. That being said, I don’t know what has been discussed about Moss’ value. As he mentioned in his comments he supposedly has not been contacted at all about his contract. From a human resources perspective that seems to me bad personnel management. I hope he can stay with the Patriots. Boston Sports teams have had some pretty good examples of giving up players that we should have kept given their subsequent performance. Let’s all take a step back and let Randy Moss and the Patriots do what they do best, play football.